Amazon just wrapped up a successful holiday shopping season. It sold 36.8 million items on Cyber Monday alone, or 426 items per second. A pair of “Sterling Silver Amethyst Flowers Earrings,” which beat out the “Sterling Silver ‘I Love You To The Moon and Back’ Two Piece Pendant Necklace.” What’s surprising isn’t that the most popular jewelry item is purple. These earings just seem a bit elaborate to have garnered such wide appeal. A Tovolo Ice Mold, which makes spherical ice cubes. The ice mold is a neat but strange choice given that the ice cubes it makes are large, and don’t fit into many standard cup sizes. It beat out a far more traditional non-stick baking mat set and Cuisinart griddle. Everyone fashions himself a mixologist these days: Amazon says it sold enough Tovolo Sphere Ice Molds to fill Mad Men‘s Don Draper’s whiskey glasses for 251 years. An art set. The Darice 80 piece deluxe art set, which comes with everything from color pencils to watercolor cakes and crayons, sold better than any vacuum cleaner, ornament, or decoration. It even outsold Swarovski’s perpetually popular crystal star ornament. The Fitbit Flex Wireless Activity + Sleep Wristband, a sleep, exercise, and health tracker that straps onto one’s wrist. Amazon sold more Fitbit wristbands this holiday season than it did Philips electronic toothbrushes and Braun electric shavers. The popularity of the little gadget is a pretty clear nod to the growth of the internet of things and growing comfort with mini, wearable computers, as well as the skyrocketing trend in health obsessiveness. When Charlie Rose walked in and saw the Prime Air drones sitting on a tabletop for the show-and-tell, he exclaimed “Oh, my God!” It was a genuine reaction– Rose and the 60 Minutes team weren’t in on the secret beforehand. 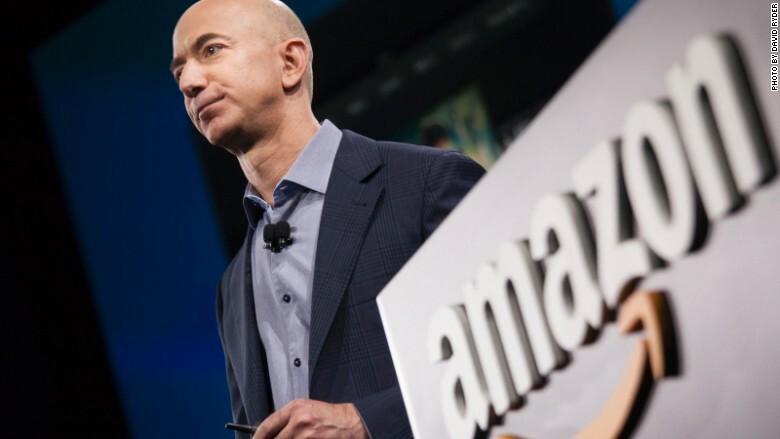 The story had been in the works for months before the Amazon representatives started hinting that a new project might be revealed to 60 Minutes. “I only knew that there was a surprise coming. I had no idea what it was,” says 60 Minutes producer Draggan Mihailovich. “They kept saying over and over again, ‘Whatever you think it is, it isn’t.’” Mihailovich grew skeptical when the Amazon PR team began to hype their surprise behind the scenes. “How great can this be?” he thought. When Rose, Mihailovich, and Sommer finally saw the drones, they were perplexed. Then Bezos played a Prime Air demo video for the 60 Minutes team that showed how his octocopters will pick up packages in small yellow buckets at Amazon’s fulfillment centers and whiz through the air to deliver items to individual customers 30 minutes after they hit the “buy” button online at Amazon.com. What do you think of Amazon Prime Air? Can Bezos bring his vision of octocopter package delivery to life– and can he do it safely?